Volusion is a revolutionary software technology that brings Live Customer Support to a website. Registered users get a unique volution ID which is required during embedding it in the website or your wordpress blog. In this article we will tell you how you can embed the volusion Customer Support web based client on your website or your self hosted wordpress blog. 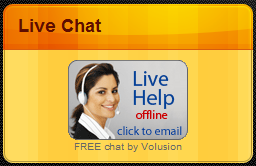 There are two ways of embedding the Volusion Live Chat module on your website, either using java script or using PHP. We will show you both. The PHP code can be used in any website but not directly in your wordpress widgets.